These pictures were taken at the Rothschild Zoological Museum, Tring, England during 2004 and 2006 (all photos Sarah Hartwell). These are photos of the miniature lapdogs: the Russian Lapdog and Mexican Lapdog (with other breeds for size comparison). 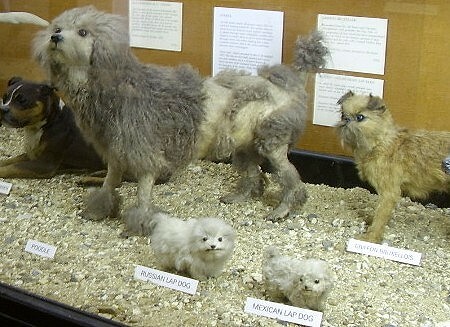 The actual specimens are about the size of hamsters, however it must be noted that Victorian taxidermists often stuffed and mounted juveniles to look like adults. The specimens here are juveniles. Shown in front of a Bruxelles Griffon for scale. To the left is the Russian Lapdog, to the right is the Mexican Lapdog. Both are white, fluffy and the size of a large hamster. The Mexican Lapdog. For those who think the „hamster-size“ is an exaggeration, some idea of scale can be gained by comparing the 2 Lapdogs to the Griffon and to the labels, which are the same height and typeface for all the breeds shown on this page. 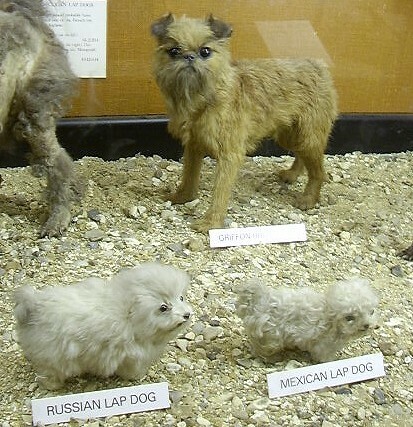 The Mexican and Russian Lapdogs shown with a Poodle (clipped in an old style) and Bruxelles Griffon for scale. 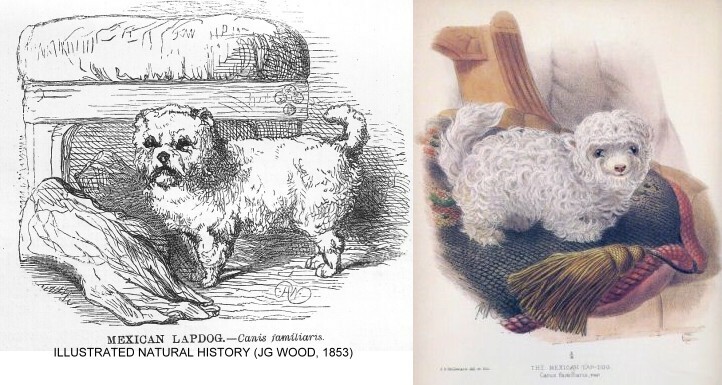 The Russian Lapdog on this page dates from the 1800s and is a juvenile. The modern Russian Coloured Lapdog (Tsvetnaya Bolonka) is a Bichon-type decorative lapdog developed in Leningrad in the 1950s using native lapdogs and various toy breeds such as Maltese, Bolognese and Shi-Tzu to create a woolly-haired breed. Preferred colours are solid but not white and the size 20-24cm (8 inches) at the shoulder and weight 3kg (6.6 lbs). 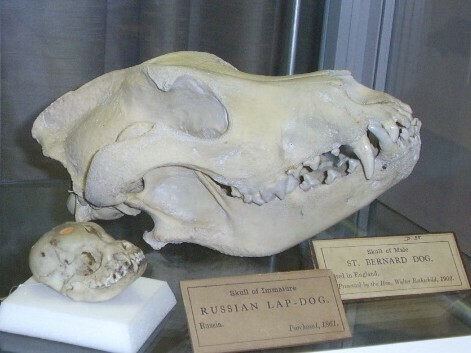 The skull of a juvenile Russian Lapdog shown with that of a Saint Bernard for comparison of size. The very tiniest of the Dog family is the Mexican Lapdog, a creature so very minute in its dimensions as to appear almost fabulous to those who have not seen this animal itself. One of these little canine pets is to be seen in the British Museum, and always attracts much attention from the visitors. Indeed, if it were not in so dignified a locality, it would be generally classed with the mermaid, the flying serpent, and the Tartar lamb, as an admirable example of clever workmanship. It is precisely like those white woollen toy Dogs which sit upon a pair of bellows, and when pressed give forth a nondescript sound, intended to do duty for the legitimate canine bark. To say that it is no larger than these toys would be hardly true, for I have seen in the shop windows many a toy Dog which exceeded in size the veritable Mexican Lapdog. 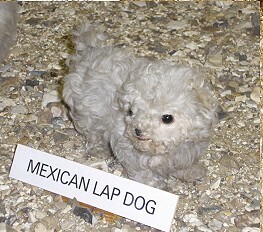 The Mexican lapdog is also pure white, but with a flesh-coloured nose. The hair on the head and body is moderately long and curly, but that of the rather short tail longer and straighter. The ears are small and not pendent. and the head is rounded, with the brown eyes widely separated from one another.